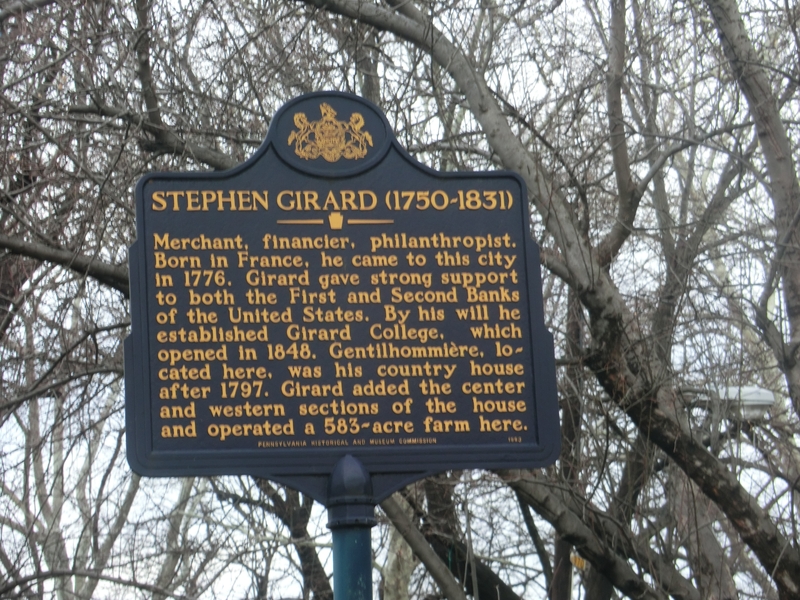 The Pennsylvania Historical & Museum Commission put up a marker to Colonial Financier Stephen Girard in 1993. It is in Girard Park in Philadelphia on West Shunk Street. I remember him from history classes of long ago, but never knew about his wife Mary Lum Girard. 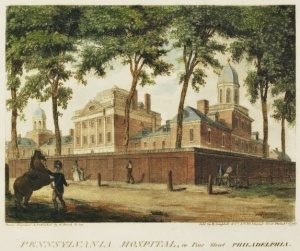 She was someone who suffered from mental illness and was committed to the mental ward of Pennsylvania Hospital around 1790, and there she stayed until she died in 1815. Well, technically she is still there. She is buried in an unmarked grave on the grounds of Pennsylvania Hospital. I was born at Pennsylvania Hospital. I spent the first almost 12 years of my life in Society Hill. My father was a perpetual student of Philadelphia history and yet I never heard of Mary until I started to read Thom Nickel’s Book Philadelphia Mansions: Stories and Characters Behind the Walls! As I was reading, I was astounded that this woman still lies in an unmarked grave at Pennsylvania Hospital. 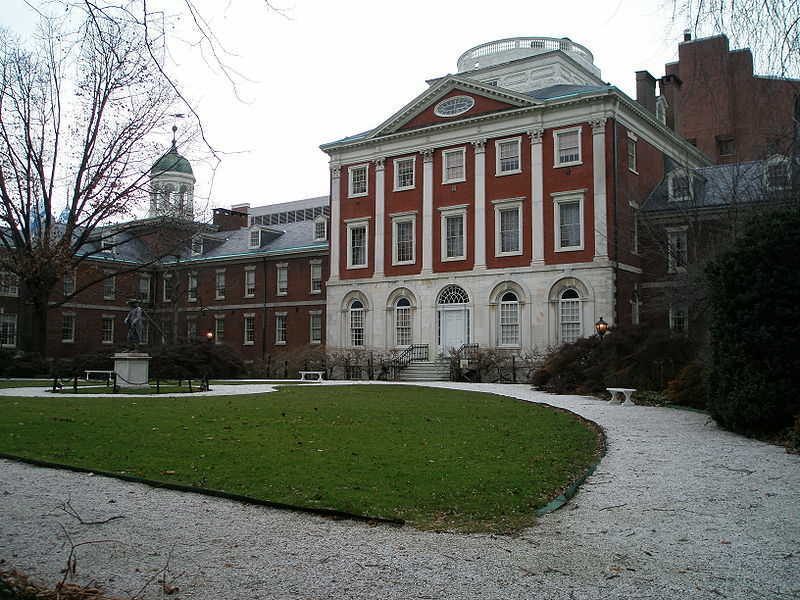 The stigma of mental illness of essentially 200 years ago is so strong, that The University of Pennsylvania Health System (“Penn Medecine”) can continue to grow their empire but can’t mark her grave. I am astounded. I am NOT sure what biography or whose writings these are from as the were posted but not correctly attributed. On ancestry I also found something compiled by a woman named Barbara Samans. In early 1785, the world around Stephen Girard began to crumble. With a suddenness that was alarming, his wife exhibited prolonged periods of uncontrolled emotional outbursts. Mental instability accompanied by violent rage over time led to a conclusion that Mary Girard was insane. They had been married but eight years. Girard was devastated. For two years, he tried without success to have the medical community help her. But in 1787, Girard finally recognized that his marriage was ended. He took a mistress, Sally Bickham, into his home to replace the lost affections of his wife. At that time, there was no stigma associated with the practice of acquiring a mistress. Girard no longer had a wife with whom he could continue a peaceful and compatible relationship. Sally Bickham would fill the void….His concerns in those troubled times were compounded by the increasingly deteriorating condition of his wife, Mary. She had been insane for five years, and there appeared to be no hope for recovery. 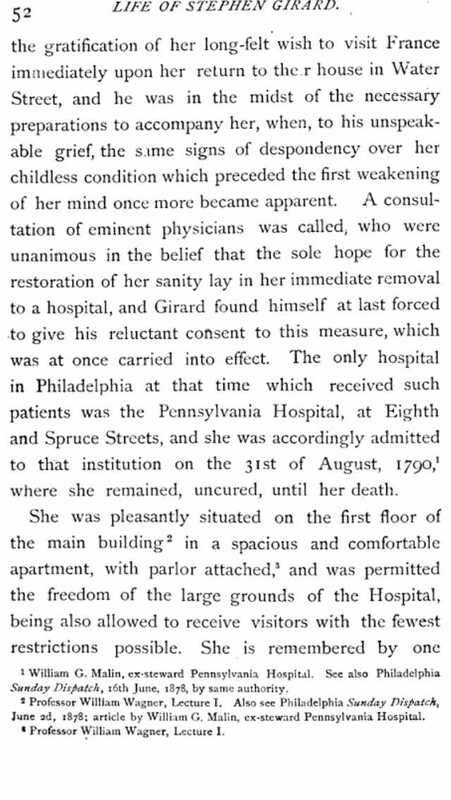 In August of 1790, Girard had his wife committed to Pennsylvania Hospital as an incurable lunatic. This was not done without total awareness of the enormity of his actions. Girard, sparing no expense, made certain that there be effort made to ease his wife’s discomfort; she was afforded every luxury possible. While confined, Mary Girard gave birth to a baby girl that died in infancy. There has never been conclusive proof that Stephen Girard fathered that child nor any proof to the contrary. Is Pennsylvania Hospital hiding ‘Shame’ of Mary Lum Girard? While the City of Philadelphia may honor Stephen Girard, the founder of Girard College, and the primary financier of the War of 1812, not much is known about his wife, Mary Lum Girard. Who was Mary Lum, and why has her name been undersold in a City that purports to honor its historic figures? A clue can be found on the first floor of Pennsylvania Hospital. A large plaque honoring Stephen Girard’s contributions to the hospital also mentions that his wife, Mary Lum, lies buried somewhere near this spot. Plaques of this size and stature don’t usually tell lies, and if Mary Lum is buried somewhere on the grounds of the hospital, where is she, and why isn’t her grave noted? he question has irked Federal Government Signal Corps retiree Joe Vendetti for almost 25-years. Mr. Vendetti traces his interest to Mary Lum to his friendship with Girard College grads Charlie Roseman and Col. Bob Ross, two World War II-era pals, who spent a lot of time talking about their college days. 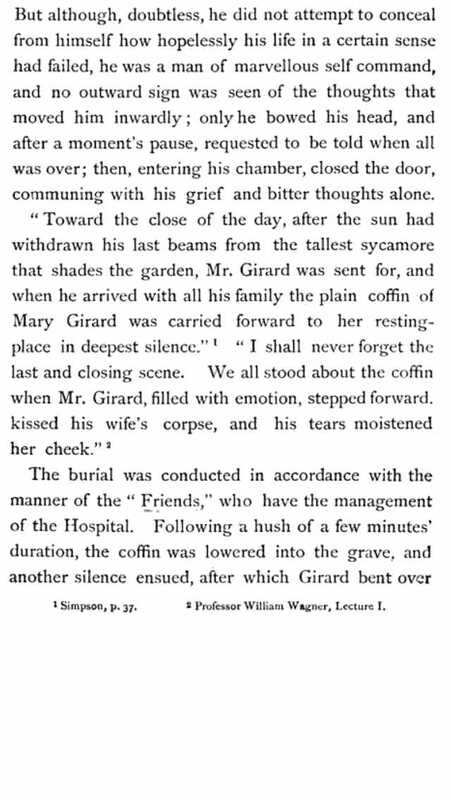 Biographies of Stephen Girard indicate that during their marriage, Mary was committed to a mental ward in Pennsylvania Hospital (in 1790) until her death in 1825. Because of her special status as the wife of Stephen Girard, she was permitted to have a series of rooms and a parlor on the hospital’s first floor. Other mental patients had a much harder time of it, as they lived in what Dr. Benjamin Rush (who was responsible for committing Mary Lum) in rooms that were “cold and damp in the winter, hot in the summer, lacking ventilation, stuffy and malodorous…” Mary Lum’s status as a mental patient no doubt had everything to do with the fact that she is buried in an unmarked grave somewhere on hospital grounds. But for Charlie Roseman’s 1939 classmates, an unmarked grave was hardly acceptable, so they purchased a tombstone for Mary Lum and donated it to the hospital. Mr. Vendetti says that the first gift of a tombstone, which occurred some twenty years ago, was not accepted by the hospital. He notes that Girard College wasn’t all that eager to help with the tombstone project, either. A shadow of embarrassment and shame seemed to cover Mary Lum’s legacy, proving that the stigma of mental illness, while far worse in the in the 19th century, still carried considerable weight in modern times. 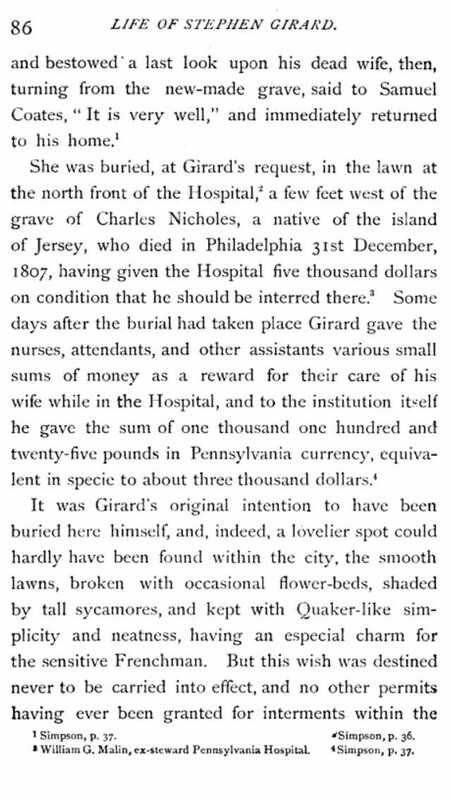 It makes a body wonder what happened to Mary Lum Girard while in-patient in the late 18th to early 19th centuries , doesn’t it? And why can’t she be remembered with a simple plaque on hospital grounds since she spent a fair portion of her life there? And died there? ….Few know the extent of Girard’s accomplishments. Still fewer know the story of his marriage to Mary Lum,the early years of their life together, the slow decline of Mary’s mental health, and the final difficult decision that necessitated her commitment to Pennsylvania Hospital. wife. Over the years, those early, happy, and productive days, have been forgotten, minimized, speculated about, and/or distorted. Those who failed to investigate evidence provided by Girard himself, led to and perpetuated misconceptions about the man and his marriage. You can also read about this on another blog about Stephen Girard “Get to Know Stephen Girard.” And Philadelphia Magazine wrote an article on Stephen Girard which also sources Thom Nickels in 2016. But back to Mary Lum Girard. She is is a fascinating and ghostly figure of American history and Philadelphia history. Compare to other mental patients of early America, she lived out her life somewhat luxuriously given the wealth of her husband, correct? She was thought to have suffered from bipolar disorder or Schizophrenia, right? Are we historical figure shaming (Stephen Girard) if too much is known about Mary Lum Girard? Why won’t Penn talk about a 200 year old woman? How can they say with a straight face that they are protecting a patient information? She lived and died a couple of centuries ago and Penn Medicine did not even own Pennsylvania Hospital back then, did they? So why is Penn Medicine being an obstructionist of history? What is it people would learn if they disclosed historical data about her? Why can’t they even mark her grave simply? She is buried on the grounds of Pennsylvania Hospital and there are no records of her remains being moved, are there? Is the stigma of mental illness still so strong a 200 year old woman can’t have her grave marked? It’s a veritable Nancy Drew mystery. I suggest people buy Philadelphia Mansions for more of these amazing tales of our regional history. It’s not just the houses, it’s the people who lived there.Thanks for stopping by. Post Script: Received the below response from Penn Medicine. I asked them to tell me more precisely where the plaque is, because I find it odd that they would put up a plaque on the hospital grounds and not just tell people because it has been a bit of a controversy and not just via my blog post. I also did not receive a photo of this plaque. And to be honest, a plaque is not the same as a headstone. She lived the remainder of her life and died there, she didn’t just visit on a special occasion.